The first phase of allotment to Professional Degree Courses (Except MBBS/BDS) 2014 will be published on 25th June on the website www.cee.kerala.gov.in. 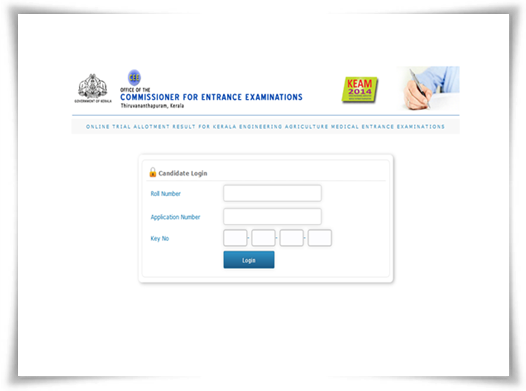 Commissioner of Entrance Examinations will publish the first allotment for admission in Engineering/Medical/Architecture, Kerala for the academic year 2014-15 while the details of allotment will be available on the home page of the candidate. The candidates are advised to take print out of the first phase allotment memo and submit it before the college authorities during the time of admission. Candidates who receive allotment at this stage have to remit the fees as specified in the first phase allotment memo. The fees can be remitted at designated branches of State Bank of Travancore (SBT) from 25th June to 3rd July 2014 in order to accept the allotment. The KEAM allotment schedule 2014 with important dates concerning the admission procedure is given here. The list of SBT branches will be published for reference on the web portal. Those candidates who allotted to MBBS/BDS courses alone should report for admission in the respective colleges as per the admission schedule already published on the official website. Candidates allotted to all other courses need not join the colleges as per the notification issued regarding the allotment process. Candidates have to produce the first phase allotment memo, data sheet and originals of all documents during the time of admission. Candidates who got allotment in Private Self financing Engineering Colleges should pay the balance fees at the time of admission as mentioned in the allotment memo in the respective colleges. Those who fail to remit the fees or do not join the respective institutions within the specific time will be removed from the entire allotment process. The activities relating to the second phase of allotment will be informed in due course through a notification. The KEAM 2014 allotment notification would serve as a help proving complete details about the allotment schedule and list of colleges. To check the KEAM allotment status 2014 online, do visit the official website.